How to give the old-fashioned grilled cheese sandwich an intoxicating new flavor. In a saucepan over medium heat, melt together 1 tablespoon of butter and light brown sugar. Add the apple pieces, cooking until soft and caramelized (about 5 minutes). Stir in the lemon juice and remove from heat. 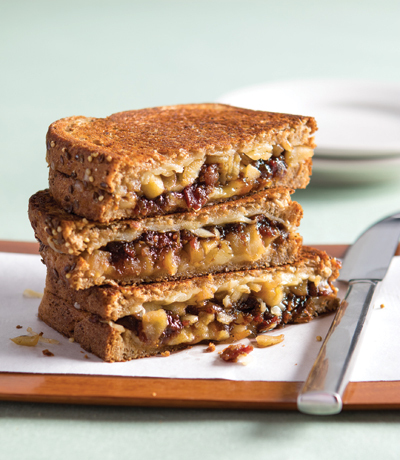 On a plate, assemble the sandwiches by laying out two slices of bread and topping each with a slice of Gruyere cheese, 2 tablespoons of Bourbon Bacon Onion Jam and half of the caramelized apples. Top each slice with the remaining cheese and bread. In a large skillet over medium heat, melt 1 tablespoon of butter. Carefully place both sandwiches in the skillet and cook until the cheese begins to melt (approximately 2-3 minutes). Use a spatula to flip the sandwiches over and continue cooking another 2-3 minutes until the bread has browned. Remove from the skillet. Slice diagonally and serve. In skillet over medium-high heat, cook the bacon until crisp. Using a slotted spoon, move the bacon to a paper towel-lined plate to cool. Pour most of the bacon grease into a heatproof container to save for another use, leaving about 1 tablespoon in the skillet. Add the onion, shallots, and light brown sugar to the skillet, cooking until tender and caramelized (about 10 minutes). Stir in the garlic and cook 1 more minute. Return the bacon to the skillet, along with the maple syrup, chili powder, instant espresso powder, and black pepper, cooking about 2 minutes. Pour in the balsamic vinegar and bourbon and let the mixture boil for 1 minute. Reduce the heat to medium-low, and allow the mixture to simmer until most of the liquid is absorbed, about 15 minutes. Remove from heat and allow the jam to cool for about 20 minutes. Put the jam in a blender or food processor and pulse the mixture a few times until you’ve reached your desired consistency. Store in clean glass jars in the refrigerator. Original recipe by Meagan Burke. Meagan Burke is a French Quarter-based bartender and baker. Visit her blog, fandbdepartment.com, for more of her decadent (and often boozy) concoctions.